Is there such a thing as an expanded universe story being too close to its source material? I ask because, after having drooled all over The Promise two weeks ago, I find myself really struggling to figure out what to say about The Search beyond one very specific aspect of it. That’s not to say it’s not ‘good’. It’s very good, and I can certainly see some ways where it’s arguably better than it’s predecessor. It’s a more focussed narrative than The Promise for one thing, and while there’s no noticeable difference in the quality of Gurihiru’s artwork, the potential of what can be done with the aesthetic of Avatar’s world is shown off better here. So yes, if you are an Avatar fan, The Search is absolutely worth your time, especially when you consider its premise is meant to answer the one major plot thread that was left hanging at the end of the show. However, what it doesn’t do for me, as The Promise did, is provide me with much I wouldn’t have expected to see in an episode of the show, and relies more to call-backs for the fans, than taking the story in new directions. It may seem churlish (hell it certainly does to me) to offer ‘It’s just more Avatar’ as a criticism, but I can’t help it when the bar has already been set so high. A short time after the events of The Promise, Zuko is still struggling to find his centre as Lord of the Fire Nation, and believes the answer may lie in the question that all fans were left to ponder at the end of the TV show (“Where is my mother?”). While it is almost too easy to make fun of Zuko’s brooding nature, it can never be argued that it’s overblown when the one parental figure he has known for most of his life burned half his face off for speaking out of turn. Understandably, Zuko hopes that reconnecting with a side of his family that is less insane and tyrannical will help bolster his own better nature. The problem, is that since her banishment no-one has seen his mother Ursa in years, or has any idea where she is. 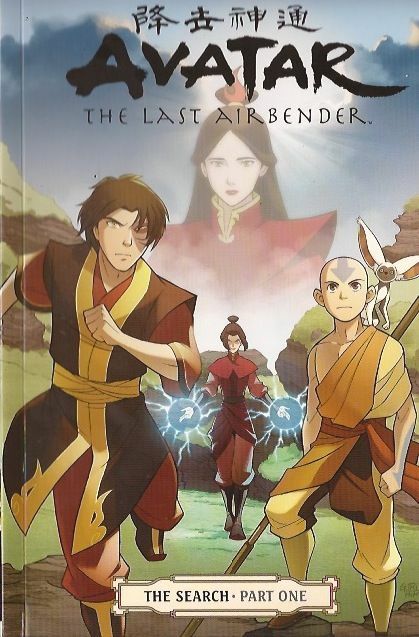 In order to find her, Zuko must recruit the usual Avatar gang (sans Toph because hey, why would you include The Best Children’s Fictional Character Ever in a story so important to the legacy of the franchise, right? ), as well as Azula; his sociopathic, jealous, lightning-spewing sister. … Ozai is a f***ing c***! Okay, so it’s still hardly a revelation for this series that the former Fire Lord was a bad guy. As I’ve said before, his masterplan in the show was to cover the whole world in flame, so nobody should really be expecting him to have a soft, gooey centre underneath it all. Still, it takes a lot to take a guy already so evil as to mutilate and exile his own son for no reason, and say ‘You know what? We can make this guy worse”. That’s what The Search does, and it’s for that reason that the flashback portions of the story, examining the marriage of Ozai and Ursa in detail never seen in the show, that this arc really comes alive for me. Make no mistake; this guy is Ramsey Snow levels of cruel. Not as graphic, of course, this is still kid’s stuff, but I’m honestly not sure I’ve ever found another character as repulsive as Ozai appears here. As I said, OZAI IS A F***ING C***! I mean wow. Just… wow. I don’t know about anyone else, but I can’t think of a worse way to try and emotionally scar a parent than to harm their children for the crime of wishing said children hadn’t been fathered by a monster. In the show, Ozai was undoubtedly a menacing presence. It was never difficult to wrap your head around the idea of him as a threat, but at the same time, you never really knew enough about him to hate him on a personal level. This story though? In order for it to work, you have to understand how horrible it must feel to actually live with someone like that. In order not to judge Ursa for her actions, you have to feel how much pain her marriage has caused her, that it would motivate her not just to abandon her children, but to erase all memory of them, and it’s the one part that The Search pulls off spectacularly. Unfortunately, that’s all this story has to offer that I can describe as really special. As I said, it’s still good, but by Avatar standards, none of the new characters (beyond Ursa herself) are especially interesting, the Forgetful Valley, and the spirit-shenanigans contained within, are the only new location that is visually arresting. The story hints at having an interesting new conflict in the present, with Zuko wrestling with being relieved at the idea his claim to the throne might be illegitimate, while Aang sees the role Zuko plays in maintaining peace as being more important than his right to rule. However, as already explained, that quandary neatly sorts itself out before either of them can really dig into the subject. It pains me to say it, but the worst part might actually be Azula. Despite her being one of my all-time favourite villains. Her cold confidence and focus in the show acting as the perfect foil to Zuko’s angst and fury. Here, post-defeat at the finale of The Last Airbender, we find that poise and precision replaced by a lot of ranting and raving, and it’s just not very interesting. She’s still a talented firebender, and a credible threat to the rest of the main cast, but rather than being gripped, I found myself rolling my eyes a little every time the quest was interrupted by another outburst of hers. In spite of where I feel it falls short, I’d still call The Search a must for Avatar fans. It does an admirable job of telling a story you may have been waiting to hear for awhile , and gives a deep and disturbing insight into the relationships of the story’s most prominent family. That said, it did leave me wanting more, and we’re going to get more next time, when Adaptive Panels takes a look at The Rift. Yeah… how about that for a segue huh? …That was this week’s Adaptive Panels!!! Check back tomorrow for a new VuePoint article!! !